Other: Part of the Wolves of Mercy Falls Trilogy. Shiver came out in 2009, the final book Forever will be published in July, 2011. Grace and Sam must fight to be together. For Grace, this means defying her parents and keeping dangerous secrets. For Sam, it means grappling with his werewolf past ...and figuring out a way to survive the future. 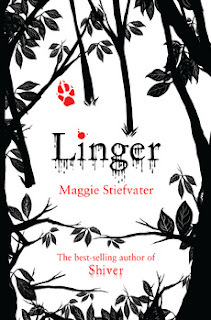 Linger is the second book in the trilogy by Maggie Stiefvater about the Wolves of Mercy Falls, and oh my does she know how to build up the tension. I loved Shiver and was stunned by the ending of it, so I couldn't wait til this book finally came in - and I read it within 24 hours. In Linger, Sam and Grace have to fight to stay together with parents who suddenly seem to realize that they have a daughter, and the fight Grace has to put up herself. I have to be honest and say that I loved Shiver more than I loved Linger, but as the sequel to my favorite book of last year, it lived up to my expectations. And now.. I'll have to wait for Forever to come out in July. I don't think I can wait that long..
Because I love it. I love the way Stiefvater writes the story. Her storytelling is great and has me hooked - I want more!